Whilst summer is here make sure you look the part in our fabulous exotic print cami midi dress. Sleeveless yellow cami panelled midi length dress with a bustier front and waist band detailing, thin adjustable straps and all over tropical floral print. Wear with strappy sandals and drop earrings for a gorgeous summer look. 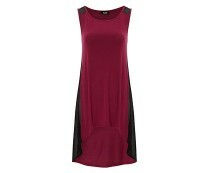 Sleeveless jersey dress with sheer panels to side featuring dipped hem from G:21 range. Dress length is approximately 36 inches.